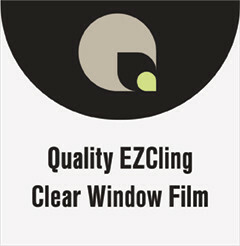 4.0-mil polyester clear film uses a unique polymer technology that allows the film to easily cling to glass or other smooth surfaces. Create impressive graphics for window displays. Utilize as a protective film for windows and smooth surfaces. Designed to be user friendly and cost effective. EZCling is thick enough to adhere on a clean surface by a store or business employee using a dry application method. Compatible with UV ink jet printers. Wet application can be used for enhanced placement. This product meets the current standards of the Consurmer Product Safety Improvement Act. The base material has natural diffusion properties resulting in high impact prints, whether they are backlit or frontlit. Vibrant colors with superb light diffusion quality, will withstand heat from prolonged backlit exposure.